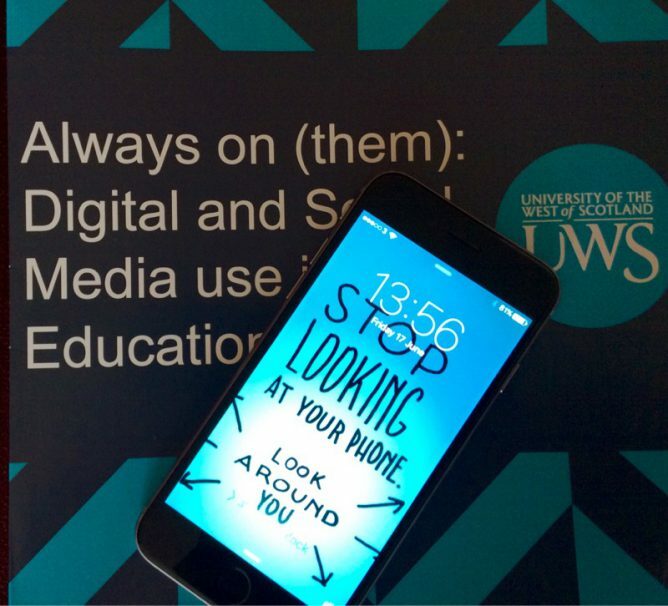 On Thursday I attended the Always on (them): Digital and Social Media use in Education event at the University of the West of Scotland. This was organised by Professor David McGillivary. I only stayed for the morning as I had to get back to run a twilight course. Very disappointed to have to leave early as the morning set up some great questions for discussion in the afternoon. I was speaking just before lunch and as I listened to other speakers I had to update my talk on the sly. I recorded the audio for all morning speakers for edutalk, I’ve now posted them with a DigitalUWS tag. In my presentations I briefly described my own history of blogging and podcasting at Sandaig, Glow Blogs and ended with some questions. Preparing for the talk allowed me to think sound some ideas that have been buzzing in my mind for a while. I hope to tease them out in a few subsequent posts or microcasts. Are we getting the best out of Social Media? Should pupils be more involved in posting? Do we read others productions or are we using SM as a broadcast? Are we aware of the costs & implications of using free commercial software? Do we need to teach, copyright, ownership, where is my stuff? Long form via short form, where is your attention at? Media, 140 chars vs Video vs Audio vs Long Form? As professionals do we have enough understand the tools and their affordances? Do we know any more about Internet Princes than youngsters? I think these are important questions and the answers to some are simple but others are very complex indeed. I believe we need to think a lot more about the software we use and the effect it has on communication and on us. Hopefully I’ll think a bit more about this in some subsequent posts/microcasts. If you didn’t make the event I’d recommend listening to the audio and the Twitter stream #DigitalUWS has some good stuff too. Featured image, my own photo, I though my lock screen image is relevant to some of the things I was trying to talk about.